If anyone is interested in skiing and hiking in Europe, Zermatt is a best spot. It is a small village located at the Valais Canton at an altitude of 1600 metres. It is close to the base of Peak Matterhorn as it is a mountainous region above sea level and provides year round access to down skiing. This place is also recognised as a world-renowned resort. It is very safe to walk from one town to another. There is no need for any cars on this road. There are best network of alpine cable cars, gondolas and cog railways in Switzerland. It is a snow fall region. 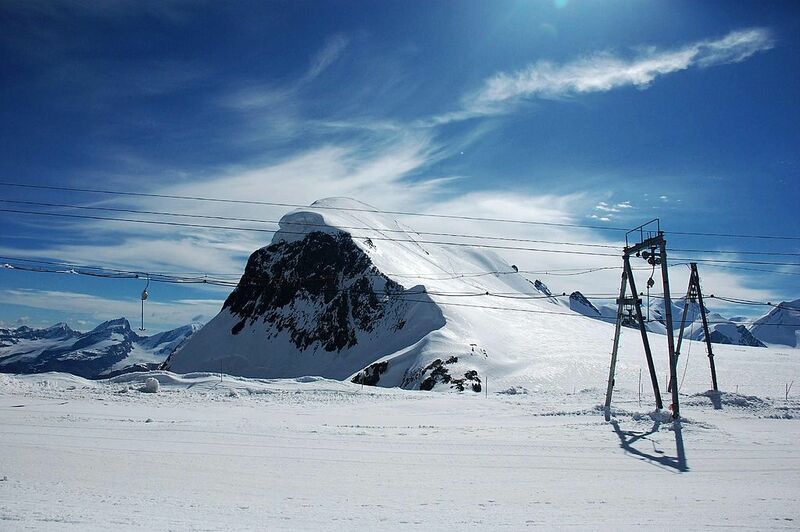 Here skiing is practised throughout the spring and at the beginning of summer and in winter .The Haute route a challenging route takes several days to complete right from Mont Blanc to Zermatt. An English explorer Edward Whymper was the first to climb the Matterhorn and succeeded. This Matterhorn Mountain is also known as Toblerone Mountain. There are many sightseeing areas like Matterhorn Museum. It is a museum of ice built underground. It gives a full history about the lifestyle and climbing of Matterhorn it also aches to hear how out of 7men 4 died during their descent from this mountain. Matterhorn glacier paradise is the highest and largest skiing region in Europe. The view from the platform is really breath-taking and one can really feel the elevation. Food and drinks are also available to refresh yourself. You are taken in the lift inside a glacier and made to walk through the tunnel in the glacier with ice sculpture. It is beautiful from every side. Matterhorn Ski Paradise is awesome just skiing from top to bottom. There are plenty of different slopes right from easy slopes to steep slopes. Forest Fun Park is a great attraction for Kids. It offers 350 metres of bridges, ladders and zip line built amongst the pine forest at the south end of this place. Visitors flock to Zermatt for culture, shopping, world class Spa, traditional and international cuisine. Churches are also very beautiful, visitors pay homage to the ones who gave their lives while climbing up. Mountaineers cemetery is one of the saddest places where many who had a wish to climb up but couldn’t make it to the top. There were buried in this cemetery. There are many Ski schools like Stoked Swiss Ski and Snowboard School,Matterhorn Diamonds Ski School and Summit ski school that offers four days or two days packages to learn how to ski along with an instructor. They also provide boots and other clothing’s while skiing. Those who have a craze for fishing also can fulfil their dreams, there is beautiful Alpine lakesat the Matterhorn as backdrops where you can catch trout’s and ask the restaurant to cook. Sunset and Sunrise trip is a great experience where you have to spend an overnight at the lodge above the lake. The restaurants of Zermatt also have different types of cuisine like French, Europe and Italian. Some are situated on top of the mountains where one can enjoy the view while having their meal.Nightlife is also enjoyed by tourist in pubs. Do not miss out on bringing and tasting the lovely milky chocolates. Lindt chocolate shop Zermatt, Chocolate Laderach, Metzgerei Bayard is some of the famous shops. Do go and explore the adventurous Alps along with your family which can be experienced once in a life time!